Music is the universal language of mankind. St. Augustine wrote, “He who sings prays twice.” Music can move one to a deeper communion with God, the Father, Son, and Holy Spirit. St. Mark's has a variety of ways to offer these gifts in praise of God. Volunteer singers meet weekly from September to June to prepare for the traditional worship services at St. Mark’s. They also sing at seasonal services such as Christmas Eve, Holy Week and Easter, Choral Evensong, and special musical events. Members of the choir have also sung with other area Episcopal and Lutheran churches at special services and concerts, and have participated in a large combined choir at the National Cathedral for the Royal School of Church Music and at the Consecration of the Fourteenth Bishop of Maryland. 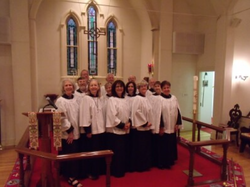 The Parish Choir is a vibrant, energetic, caring group of singers that meets Thursday evening from 7:30 to 9 p.m. The choir’s repertoire includes music from the great Anglican choral tradition, American music, Gospel and Spirituals, Taize, and contemporary works. For information on joining the choir, please contact the Director of Traditional Music, Rosemary Beakes at rbbeakes@hotmail.com. Children who love to sing and are beginning to read well are encouraged to join to sing God’s praise. When schedules, the children’s choir sings at the traditional or contemporary service. They also sing during seasonal services such as Christmas Eve, Palm Sunday, and Pentecost, as well as at special musical events. Rehearsals include learning basic music theory and incorporating musical and rhythm instruments with singing instruction. Choristers include children in Grades 2-7 with a special training choir for K, 1st grades. Currently, practices are on three Wednesday evening a month from 6-7 p.m. (with pizza!). Please contact Rosemary Beakes at rbbeakes@hotmail.com for more information. Teens in Grades 8-12 who love to sing are encouraged to join. Singers have assisted in the past with both the contemporary and traditional services, as well as singing for seasonal services and special musical events. Please contact Rosemary Beakes at rbbeakes@hotmail.com for more information. Use of instruments and choir chimes to enrich the worship at St. Mark’s is important to the ministry of music. All those who play musical instruments are encouraged to participate. Rick and Margaret LaRocca lead the music for the contemporary service on Sunday mornings. Presently the ensemble includes acoustic guitars, vocals, clarinet and saxophone, piano, and drum. We welcome the addition of other instruments. Send an email to the LaRoccas at laroccamusic@gmail.com if you are interested in joining the team!